Pink Family. Caryophyllaceae. Purple Cockle. Agrostemma Githago L.
Other Common Names: Corn Cockle, Corn Rose, Corn Campion. Fig. 20. - Purple Cockle - Agrostemma Githago. Seeds five times natural size. per 100 lbs. live weight. 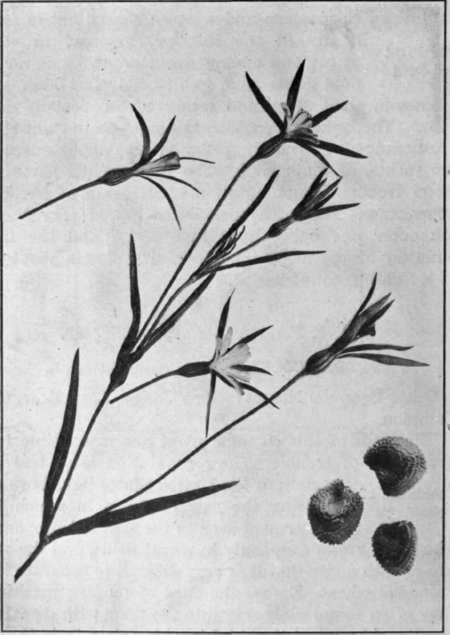 Later investigators obtained different results, and it has since been found that the amount of poison in the seed varies for different seasons and different soils. The toxic substance is saponin, of which the seeds contain up to 6.56 per cent. This same substance is also contained in other parts of the plant, but in such small quantities that no harm has arisen from its presence. It has an acrid taste but no odour, and is easily soluble in water, producing a solution which froths when shaken. Githagism is the name given to a chronic poisoning caused by the taking of repeated small doses over a long period of time. The symptoms are a gradual loss of strength and wasting of flesh, accompanied by chronic diarrhoea and nerve troubles, ending in death. These symptoms are produced in human beings by the use of flour containing cockle. They are not found in lower animals with the exception of pigs. The acute poisoning caused by large doses is described as follows by Chesnut: "Intense irritation of the digestive tract, vomiting, headache, nausea, vertigo, diarrhoea, hot skin, sharp pains in the spine, difficult locomotion, and depressed breathing. Coma is sometimes present and may be followed by death." We quote from Long the symptoms which Cornevin observed in different animals: "In the horse, if a small quantity only is taken, there is yawning, heavy colic, stamping and evacuation of rather soft faeces. If larger quantities are taken, the symptoms, which commence in about an hour, are salivation, frequent yawning and turning of the head, colic, pale mucous membrane, hurried and weak pulse, rise in temperature and accelerated respiration. Some time later there are muscular tremors succeeded by pronounced rigidity, and the faeces are diarrhœic and foetid. The animal lies down, and getting up is painful; it falls into a kind of coma, stretches itself to the utmost, and death takes place without convulsions. "In cattle, the symptoms observed one hour after eating are restlessness, salivation, and grinding of the teeth. Excitement and colic are followed sometimes by coughing, this state lasting from five to eight hours. There is then a period of coma, characterized by permanent decubitus, repeated foetid diarrhoea, hurried and plaintive respiration, accelerated and gradually weakening pulse, a gradual loss of motor and sensory powers, and a progressive decline in temperature. Death occurs in twenty-four hours. "In the case of pigs, the animal grunts, lies down and remains thus with its snout embedded in the straw. There is vomiting, more or less violent colic and diarrhoea, the evacuation consisting of bad-smelling, spumous faecal matter. At times there are clonic contractions. Young pigs are most susceptible." Pott cites cases in which abortion was a feature of the poisoning, both in cows and pigs. The action of saponin is counteracted by extract of digitalis. Oils and demulcent drinks are also recommended. The plant is common in the winter wheat fields of Europe and North America, and in the spring wheat of a few districts. It is about the height of the wheat plants. Its stems and narrow, pointed leaves are greyish green, owing to a scatttered covering of fine, silky hairs. The rich, purple flowers, one to two inches across, with the five green, pointed sepals standing out beyond the petals, warrant the name Agros-temma, or "crown of the field." The seeds are enclosed in a flask-shaped, one-celled capsule with a central column to which they are attached. When ripe the capsule opens at the top and the seeds break loose from their fastenings. They are jet black when ripe, from one-twelfth to one-eighth of an inch in diameter, and somewhat flattened. They are characterized by rows of teeth which curve round from a notch at the point of attachment. Fragments of the hulls are readily identified in ground feeds by these teeth. prev: Grass Family. Gramineae. Darnel. Lolium temulentum L.
next: Antidotes. Cow Cockle. Saponaria Vaccaria L.